TSO Pops! and Cirque de la Symphonie perform at 7:30 p.m., Friday and Saturday, Jan. 29 and 30; and 2 p.m., Sunday, Jan. 31, at Tucson Music Hall, 260 S. Church Ave. Tickets are $24 to $62 (available at the website or the Tucson Box Office, 2175 N. Sixth Ave.). Call 882-8585 for more information. Suspended in the air by long strands of seemingly fragile silk, Christine Van Loo performs mind-boggling aerial feats that bedazzle audiences. Van Loo, a seven-time national champion in acrobatics, will make her Tucson debut with Cirque de la Symphonie. A new production designed to meld the excitement of the circus with the enchanting melodies of the symphony, Cirque de la Symphonie features performances by aerial flyers, acrobats, contortionists, dancers, jugglers and strongmen—all while accompanied by a full orchestra. "Performing with live music is my favorite thing to do," said Van Loo. "Performing with a live orchestra is the most amazing thing in the world. 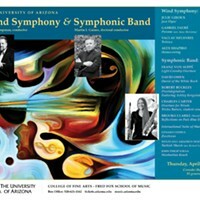 Directed by George Hanson, the Tucson Symphony Orchestra Pops! will provide a musical score featuring the music of Bach, Tchaikovsky, Saint-Saëns, John Williams and others. Cirque de la Symphonie emerged when the group's executive director and producer, Bill Allen, came up with the idea to mesh circus and symphony. While traveling through Russia in the mid-'90s, Allen said, he worked with many performers who wanted to go beyond the circus, and he started feeding the artists into theater groups. "Finally, someone asked me: Why don't you present the cirque and theater performing arts in a package?" he said. Several years later, Allen's idea became a reality. "We are probably the only company in the world that combines a world-class cirque act with a symphony orchestra," he said. The performance will entertain both seasoned concert-goers and new patrons alike, promised Allen. "We get comments from musicians that say this is quite an amazing program," he said. "They have a lot of fun with it." The musical score will feature 13 separate pieces, ranging from the sadly sweet violins of Saint-Saëns "Danse Macabre" to John Williams "Harry's Wondrous World," from Harry Potter and the Sorcerer's Stone. With only a limited amount of rehearsal time with the Cirque performers, Hanson said the orchestra's greatest challenge will be maintaining the tempo of the Cirque performers' routines. "I really think the crowd is going to love this performance," said Hanson. "I think a 10-year-old would love this performance." While most 10-year-olds probably aren't saving their milk money to buy a copy of Dvoák's "Carnival Overture, Opus 92," the combination of classical music and renowned aerialists and acrobats can only help to broaden kids' musical perspectives. "It brings so many different age levels together," said Van Loo. "When kids see the performers accompanied by classical music, they appreciate the music more." The physically imposing Jaroslaw Marciniak and Dariusz Wronski are both former Polish national hand-balancing champions and will perform a dynamic balancing act to Bach. Christine Van Loo and Efe Ilkay will perform a duo trapeze act to Tchaikovsky's "Valse" from Swan Lake. Ilkay joined Cirque de la Symphonie after working as a professional volleyball player, a high-flying trapeze performer and the lead instructor at the Trapeze School New York. Sergey Ignatov, a world-champion juggler, will also display his talents. He claims to be the only artist in the world who juggles spinning propellers as part of his routine. Hula-hoop performer Irina Burdetsky will perform to "Danse des Bouffons" by Rimsky-Korsakov. In addition to being one of the youngest performers to travel with the Moscow Circus, she was awarded the Grand Silver Medal by the Queen of Monaco at the Concours International Des Ecoles de Cirque in Monte Carlo. Contortionist Sonya Petrova will also perform. With more than 20 years of experience in rhythmic gymnastics and dance, Petrova is a four-time Bulgarian national champion. Allen said he is excited to work with Hanson and the TSO; he referred to the TSO as "one of the fastest rising orchestras in the country."